Who Stood out at U15 Nationals? St John’s, Newfoundland–This past week I was fortunate enough to attend the Youth 15 Canada Basketball National Championships in St. John’s Newfoundland as the head coach of the Nova Scotia 15s. My focus was predominantly on my team and getting them to a high level of success, however I also put on my NPH cap and took in a few games to observe some of Canada’s best 15 year olds. I did not get to see every team but the following list includes stand out players I did see and think deserve some recognition as they have bright futures, with continued hard work. The list is no particular order. Tyler Plummer, Ontario, 6’3” Guard. Tyler has an exceptional basketball body at the age of 15 and uses his physical dominance and strong handle to penetrate and slash to the rim with ease. As he develops his jump shot and pull up he will become a complete basketball player and maintain his spot as one of the top players in Canada. Josip Vrankic, Ontario, 6’7” Forward. Josip is one of those glue guys who all coaches appreciate. He goes out and helps the team in every statistical category and causes matchup problems for the other team as he has a solid post game, is a three point threat and also handles in the back court. He also bangs the boards and anchors the D. Loads of upside. Mohammed Kabeya, Ontario, 5’9” Guard. Mohammed is a lightning quick guard who uses his speed and athleticism to push offense and keep his teammates ready. He was the best player on the floor in the championship game. He is able to shred the paint in half court sets creating for himself and his teammates and provides constant pressure on opposing point guards. He shoots the ball well and has solid decision making skills for a 15 year old PG. Alex Carson, Nova Scotia, 6’5” Forward. Alex is a very good shooter with three point range who is also able to attack off the bounce and finish at the rim after being chased off as a shooter. Alex’s greatest gift is his athletic ability and how he transfers it to D. He is able to defend small guards and bang with bigs, block shots and rebound like mad. Chris Towle, Nova Scotia, 6’0” Guard. Chris is a quick guard with exceptional ball handling skills. He uses the skills to break down opposing defenders and get himself and his teammates finishes in the paint and around the perimeter. As Chris continues to grow as a PG through game reads and reaction his quickness and adept ball handling will become more threatening to opponents. Dakelle Brooks, Nova Scotia, 6’0” Guard. Dakelle is a guard that never really looks like he is going fast but is the fastest guy on the floor. He is a lock down on ball defender that can contain any and all opposing PGs. He is a solid slasher and excellent in transition O. Has a good looking jumper that needs game reps to enhance percentage. As his ball handling improves his quickness & speed will become much more evident. Anthony Longpre, Quebec, 6’8” Centre. Anthony was the best big man at the tournament. He is a very good athlete who reads the game well to get to spots on the floor for offensive opportunity and rebounding. In a guard oriented game he really went and got his, as Anthony develops his footwork he is going to grow leaps and bounds as a basketball player. William Boyer-Richard, Quebec, 6’1” Guard. William is a very good shooter who used these skills to draw in defenders and then break them down off the bounce. He competes at a high level and has a warrior’s mentality with a shooters touch. Kenetebe Junior Farquhar, Quebec, 6’1” Guard. Kenetebe might have been the best athlete in the tournament pound for pound. He is an explosive leaper who is a highlight waiting to happen. He shoots the ball well and is a good defender. Kennetebe needs to learn to assert his athleticism in a continuous manner that allows him to be a constant threat. Howard Wang, British Columbia, 6’5” Guard. Howard was pushed into the PG spot when starting PG Terrell Jana went down with a hip flexor in the first quarter of game 1. Wang has good ball handling skills and shoots the ball well. Watching him he is more of a two guard as he was able to get his own shot and attack the lane for pull ups and rim finishes. As a 6-5 guard his skills are impressive. Aher Uguak, Alberta, 6’4” Forward. Aher is listed as a forward but had the skills of a 2 guard. He penetrated well off the bounce and had a good looking jumper with range. His best skill set is his athletic ability. Aher is an exceptional athlete and as he learns to utilize his athletism and become a true 2 guard he is an exceptional talent. Ogot Ogot, Alberta, 6’3” Forward. Ogot has a solid basketball body and goes to work in the paint and on the boards. He has good footwork and finishes strong in the paint and slashes to create opportunity for himself. Like his teammate Aher and even more so I would like to see how his skills transfer to the perimeter. Daniel Sackey, Manitoba, 5’8” Guard. Daniel is a very quick guard who uses his speed and quickness on both ends of the floor and never quits on any play. He has a decent looking jump shot and attacks the paint well to create finishes for himself and his teammates. Daniel is very good in the open court. Learning to manage his speed to finish plays at a higher efficiency will give create a much greater +/- for him. 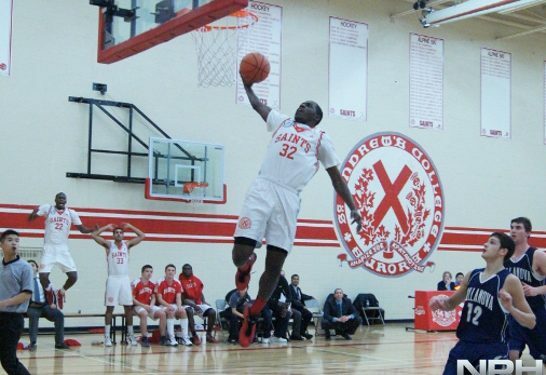 Emmanual Akot, Manitoba, 6’4” Guard. Emmanual is a good athlete with a good skill base. He has great shot form and handles the ball decently. As his transference to game skill grows he is going to become a much more dominant basketball player. Eric Braganza, Manitoba, 6’3” Guard. Eric is a hard-nosed player who just makes things happen. He possesses good ball handling skills and uses these and his slashing ability to get himself to the free throw line. Eric just works his tail off and gets things done on the basketball court as a rebounder, defender and finisher. As I watched these players and others in the tournament compete I got excited for the future greatness of Canadian Basketball. These very promising young men are willing and able to carry the torch, pushing the game to new heights. For College and University coaches wanting to learn more on Canada’s top prospects, email Info@NorthPoleHoops.com for details on the NPH Canadian National Scouting Service. Deon Wilson is a Provincial Analyst for NPH, providing coverage on high school, CCAA, and CIS basketball in Atlantic Canada. Wilson is also a Kinesiologist and personal trainer who focuses on athlete development. Team Nova Scotia 15s Head Coach for 2013 Nationals, 4-1 record 5th place finish. Team Nova Scotia 17s Head Coach 2014, 4-1 record, Nationals Bronze Medalist.